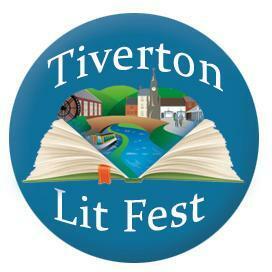 I am proud to be able to announce that the third Tiverton Literary Festival is only a few days away! Started in 2015 by myself, Susie Griggs and Kerstin Muggeridge – I am delighted to see the festival going from strength to strength. After two years at the helm, Kerstin and I have taken a step back to attend our families and our books (well, both actually) and the festival is now in the capable hands of Rachel Gee, Susie Griggs and Caro Bushnell. The new team have got a fantastic line up- you will not want to miss out. Sunday Times bestselling psychological thriller writer Jane Corry will talk about her hit My Husband’s Wife and new book Blood Sisters with BBC South West crime correspondent Simon Hall. Pop-up book swap @ CreaTIV Hub, Fore Street. Pre-loved give a book, take a book event brought to you by CAG Devon Sustainable Villages. 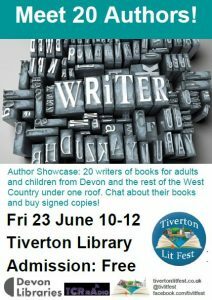 20 authors from all over the South West all in one place, including Tiverton’s own Jenny Kane. (Ohh– me!!) Lots of different styles and genres to suit all tastes. Come and meet some local talent and buy their books! CreaTIV Hub, Fore Street. Free Admission. How to give yourself the best chance of success. Have you entered competitions but got nowhere? Are those rejection letters pilling up? Read your opening paragraphs at this informal session and find out how to make your work stand out from the crowd. Come away with bags of hints and tips on how to find the best route to publication for you. Award winning writers themselves, Margaret James and Cathie Hartigan have many years of experience as creative writing teachers and competition judges. Apart from their own successful novels, they are co-authors of the #1Best Selling The Creative Writing Student’s Handbook. Elsie May’s Cafe, Phoenix Lane. 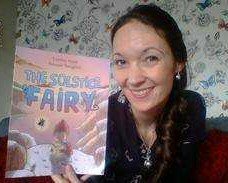 Magical storytelling event aimed at under 10s and their families, older children welcome too. Come in your best party clothes for interactive stories, munch on high tea, make party hats, and experience magical surprises. Perhaps a tiger will come to tea! High teas also available for adults by arrangement. From Cosy crime in the Cotswolds, the suspense of an unsolved death in Brighton and strange goings on in North Devon our panel has something to offer all crime fiction buffs. Brendon Books @ CreaTIV Hub, Fore Street. New books available from the TivLitFest Book Shop, pick up titles from participating authors. will be open all day for refreshments and book chat. Coffee and a cake anyone? Tiverton Library. Free: no ticket required. Start the trail with Amy Sparkes reading Ellie’s Magic Wellies, then visit some secret locations for more tales from Loreley Amiti and Olli Tooley. The trail ends with Exmoor Ponies writer Victoria Eveleigh at The Oak Room from 11.45am. Come in wellies or fancy dress. Free face painting from Alannah and craft session. NB. The end of the trail is not suitable for buggies. All children to be accompanied by an adult. 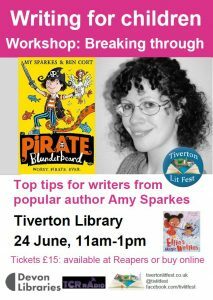 A workshop with successful children’s author Amy Sparkes whose work has been published by Scholastic, Egmont and HarperCollins. Meet author Dan Metcalf, listen to him read one of his books from the Lottie Lipton Adventures series and try your hand at code-breaking . Great fun for children aged 7-11 years. Conversations with M J Colewood about the Chester Bentley medieval mysteries and local historian Douglas Rice about ‘The Siege of Tiverton Castle’. Sorry no wheelchair access inside the castle. Historical walking tour. Learn about Tiverton’s merchants and wool and textile heritage. The walk will end at The Oak Room where you will have the opportunity to buy refreshments. The Oak Room. Tickets: £15. WORKSHOP: Exploring the young adult market with Alison Knight. The market for books written for young adults (12-18 year-olds) is growing, thanks to the popularity of authors like JK Rowling, Bella Forrest and Anthony Horowitz. As well as creating fantasy worlds that have caught the imagination of millions of teenagers and adults alike, a wide range of YA fiction also tackles life problems head on, providing emotional support and growth for young people. Author Alison Knight will lead a workshop looking at YA stories, with writing exercises for teens and adults who are interested in writing for this market. This session is suitable for beginners and experienced writers and anyone who wants to know more about the growing YA book market. Bring along your favourite YA book to add to the discussion! Sorry no wheelchair access at The Oak Room. 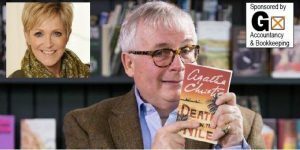 Showbiz legend Christopher Biggins in conversation with Judi Piers, award winning performance poet Lucy English, acoustic vibes from local music acts. Join us at this fabulous festival fundraiser and mingle with other festival supporters. Licensed bar. Over 16s only please. Sorry no wheelchair access. 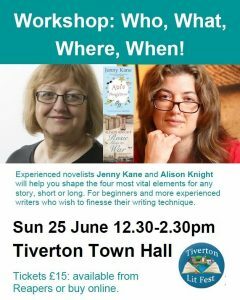 Experienced novelists Alison Knight and Jenny Kane will help you to shape four of the most vital elements for any story; be it long or short. Characters, situation, time period, and location. For beginners and those who wish to finesse their writing technique. Exeter Novel Prize winner Su Bristow, #1 Bestselling writer Cathie Hartigan, Jan Ellis and Alison Knight. Listen to this lively panel of women writers talk about their work and books. Refreshments available from Gin & Jam WI. Tiverton Town Hall. Tickets: £5. This event is sponsored by Five Cedars Health & Beauty. International Bestseller Maeve Haran and author of sweeping Cornish sagas Liz Fenwick will be in conversation with Judi Spiers, discussing their new books An Italian Holiday and The Returning Tide. Refreshments will be available from Gin & Jam WI. £9 in advance, £10 on the door. An evening with man of Exmoor Johnny Kingdom. Watch clips from his wildlife filming and listen to some West Country Tales from the very entertaining and much loved Johnny. You will also have to opportunity to buy his books, DVDs and prints and chat to the man himself! Licensed bar. Free Parking. 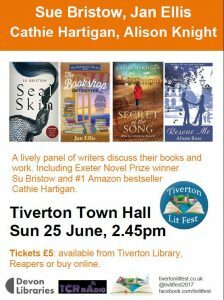 You can order tickets online or you can buy tickets in person from Tiverton Library or Reapers Health Food shop on Bampton Street, Tiverton.